We are living at a pivotal moment in history. Our economy, and perhaps our entire civilization depends on oil. But we're running out, at a time when our demand for energy is exploding. Yet industry is full of dying dinosaur corporations, mismanaged by their pointy-haired bosses, and pathologically incapable of innovating or responding to change. Our inept politicians are gridlocked in pointless arguments. What are they going to do about the problem? What they've always done! Find ways to benefit themselves at our expense, blame someone else, and only look ahead as far as the next election or next quarter's profits. If not our leaders, then who will solve this problem? We will! You, and I, and the millions of others ready to take control of our own futures. The technology exists to make incredible things happen. The information to use it has never been more available. There are bright, innovative people working on answers, right now. We have open access to world markets; both to buy and sell, and for parts and labor, to implement solutions. We can find our own new solutions. Change also means opportunity; sieze the day! Imagine... what would Tom Edison or Henry Ford do today? They would whoop for joy, and start creating a spectacular new series of world-changing inventions! They weren't scared of the future, or afraid to change the status quo! Our goal is to build a new automobile; a car for the 21st century that is as world-changing as the Model T was a hundred years ago. A car that runs on electricity; a cheap and plentiful fuel that can be made out of anything. A car that is simple, durable, and easy to build. A car that the average person can afford, maintain, and even modify to suit his needs. Why make it an EV? What's wrong with ICEs? That's a good question! Of course there are the usual "green" and "politically correct" reasons; EVs save energy , reduce pollution, avoid importing oil, etc. But frankly, most people care more about other things; cost, styling, performance, handling, convenience, comfort, and safety. So here's a list of reasons from a recent article by Shai Agassi on the lessons automakers should learn from Tesla Motors and other technological pioneers. A paradigm shift occurs when a product comes out that is fundamentally better than current products at a similar price point. EVs can do this today. A normal car will NEVER be as safe as an EV. They eliminate the explosive fuel, and minimize the toxic coolants and oils that an ICE must have. A normal car will NEVER be able to accelerate as fast, or generate as much torque as an electric motor. A normal car will NEVER be as efficient as an EV. An ICE engine maxes out at ~40% efficiency, while electric motors are above 90%. A normal car will NEVER be as simple as a pure electric. ICEs simply have far more moving parts. A normal car will NEVER match the handling of an EV. Electrics have the advantage of a lower center of gravity and better weight distribution. A normal car will NEVER be as smooth and comfortable as an EV. The precisely controlled electric motors need no transmission. The heater and air conditioner function instantly, even when parked without the engine running. EVs is intrinsically quieter than ICEs. A normal car will NEVER be as reliable as an EV. Electric motors, batteries and controllers run for years with no maintenance whatsoever. They don't need oil changes, belts, hoses, spark plugs, etc. A normal car will NEVER be as cheap to drive as an EV. Electricity is so cheap that most EV charging outlets give it away for free. OK; so why not buy an EV from one of the big auto companies? Electric Vehicles are a disruptive technology. The oil and auto companies see EVs as a threat to their business, and do everything possible to obstruct them. The auto companies have only built EVs when forced to. Even then, they make sure that their EVs are more expensive, more complex, harder to service, and more limited so as not to risk their ICE sales. They have always made them hard to get, and abruptly "orphaned" them after just a few years, with parts and service no longer available. Is that what you want? The Tesla model S is a wonderful car. It shows what an EV can be, when it is not simply a crude conversion of an ICE vehicle. However, it is also a very expensive limited-production luxury car, for the sort of people who would normally buy a Mercedes or Porsche or other exotic car. If you can afford it, go for it! EVs are intrinsically cheaper, simpler, and more reliable. But these benefits are lost when a big automaker insists on building their EVs just like their ICEs, or when a company builds exclusive luxury cars for the top 1%. We are determined to build an EV that really is cheaper, simpler, and more reliable. What an ambitious project! How did you ever get started? Bob Rice was the "spark" that started the Sunrise EV2 Project. He was a true EV pioneer who had built many EVs, and worked for many startup companies. He loved the Sunrise, and had even paced it in his own EV during its record Boston-to-NYC run. He heard that James Worden had to dispose of his remaining Sunrise parts, and went to visit him. He pulled together a group of other EV enthusiasts, who pooled their funds and bought the last remaining unfinished Sunrise, parts, and documentation. Bob had designed the CitiCar for Bob Beaumont of Sebring Vanguard. It was a crude, simple design; but they built thousands of them! No EV company since has ever come close to these numbers. Bob liked to say that they built more on-the-road EVs than all of the companies since then combined! Bob's vision was that the Sunrise should be rebuilt as a KISS design (Keep It Simple, Stupid)! Make it a kit-car, like those plastic model cars you built as a kid, but full-size! Bottom chassis, top body, glued together. Hang the doors, hood, and trunk on hinges. Put glass in it. Use a common motor, batteries, and controller -- nothing exotic; stuff you can easily buy. Design it like a generic PC clone case, so builders can pick and choose how they want to finish it. Half the weight, to get twice the performance from the same motor and controller. Twice as strong so it can carry twice the batteries, for great range even with affordable batteries. Simple, so it's easier to build, modify, and maintain. Like the Citicar, that almost anyone could fix. The Sunrise 2 looks great! I think you are truly onto something with this kit car. Are you an independent company working on this, or is it a garage project? When will you have this kit car available? How far along in the project are you? We're not yet a company; just a bunch of individuals working on a group project. We've been working to make new molds, tooling, and documentation to duplicate the car so we can all have one. The plan is then to offer them for sale so others can do the same. The original Sunrise worked, but was too expensive; Solectria was unable to secure funding to put it in production. So, we set out to produce a significantly cheaper version. To find out what it costs, we have to build one. We also need a prototype to show potential investors, so they know what they're getting. We want to prove the car works, and not just say it works. There were some problems with the original Solectria design that we felt needed to be fixed. The Geo Metro suspension they used was too flimsy. The rear axle was from a Dodge Neon, so tire and rim sizes were different front and rear. The brakes and handling were also substandard due to the undersized and mismatched parts. So, we've modified it to use 1989-97 Ford Thunderbird suspension. We hope to have the next iteration on the road this summer. Hopefully, it will be good enough to produce more of that version! The entire running chassis is finished. We already have the motor, controller, batteries, DC/DC converter, charger, and all the contactors, connectors, circuit breakers and wire needed. We have an EVision for the dash, LED lights, and pretty much everything else needed. Most of the work right now is body work; fiberglass composite body construction and finishing. At the moment (April 2012) the driver's door is nearly finished, and we're making the passenger door now. Of course, once we're satisfied with the current round of body mods, it has to be smoothed, sanded, primed, painted, waxed, and a mold made from it. Why make it a kit car? Doesn't that restrict you to a tiny market? We have no choice but to start small. The kit car market is ideal for small companies. Think about how many Cobra replicars you've seen. Maybe one or two, ever? Yet Factory Five has sold over 6000 of them! You don't need to be huge to be an automaker. Just scale your operation to your market. A product needs to be designed to suit the volumes it will actually be build in. Solectria built 10 Sunrises, but designed it to build 10,000. The result was to spend too much on tooling and automation. This cost had to be divided over the few vehicles actually produced, resulting in a very high cost per vehicle. The high cost prevented them from growing. A counter example is the Locost. It started with the book "Build Your Own Sports Car (for £250 or Less)" by Ron Champion. He outlined the process of stripping a cheap donor car for parts, and building your own chassis and body to put them in. The plans were clear enough that thousands have now been built; they even have their own racing class. I love the concept! But how would I register and licence a Sunrise EV2? It's exceedingly expensive to become an "official" auto manufacturer. There are numerous government standards, crash tests, emission controls, and other requirements to meet, all set up in favor of the major manufacturers. The barrier is so high that no new startup auto company has survived for more than a few years in a very long time. But, there are ways around these rules. First, you can "convert" an existing car into an EV. The donor car provides the title, as well as most of the important parts needed. An EV2 builder can thus register, license, and insure his EV2 as a "Ford Thunderbird" or "Mercury Cougar", using the title from his donor car. Solectria already successfully crash tested the Sunrise... and it passed! Our version has changes, but we are sticking with the original as much as possible to keep it as safe as the original. We bought the chassis, body, and most of the body panels. It was all apart; not an assembled car. The parts are quite amazing; the chassis weighs around 300# and the body 250#. They aren't the typical heavy brittle fiberglass you find in a Corvette body or tub shower surround. Normal kit car bodies are built with chopper gun fiberglass and polyester resin. It's cheap and they look great, but are heavy and weak. The Sunrise body is much lighter and stronger, and is a structural part (like the unibody of most steel cars). This complicates the fabrication, but is one of the keys to having a high performance EV. At some point, it is probably feasible to have more than one kind of body made from our molds. A cheap chopper gun body that's mostly for looks, and an expensive high strength composite body for performance. Is there room for more people in the group? Yes! There are about a dozen of us, and we're widely scattered geographically anyway. Many tasks get done remotely. People come for a visit, take home things to work on, and send back the finished part. The whole point of the Sunrise EV2 Project is to get as many people working together on it as we can. Building a car is too large a project for any one person; it *has* to be a collaborative effort, benefiting from the combined knowledge and skills of as many people as possible. If you're in the area, you're more than welcome to come for a visit, and see what we're doing for yourself! I believe Solectria was using 24 12v 90ah GM/Ovonic nimh batteries for this run. This would indeed be a 26kw pack, which works out to an amazing 70 watthours per mile! Normal EV conversions use more like 250 wh/mile. However, Worden was a grand master of the "featherfoot" school of efficient driving. The record runs were also done with the car stripped down to be as light as possible, with rock-hard tires, drafting behind other vehicles whenever possible, etc. He squeezed every mile he could out of that pack! I read about Solectria motors overheating. Was that a Sunrise-only problem? Do all direct-drive EVs have motor cooling problems? 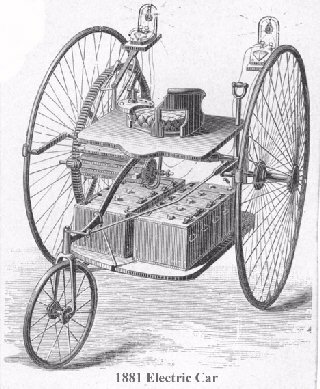 Motor overheating was a problem in several of Solectria's cars. They used air-cooled motors, and tended to undersize the cooling fans in the interest of efficiency. If you had soft tires, or climbed long hills, or lived in Phoenix AZ, or otherwise stressed the system a bit more than they expected, it could overheat. The Sunrise exacerbated the problem by being a heavier car with very small cooling air intakes in the front. But all vehicles built as EVs use direct drive motors (no transmission; just a simple gear reducer to the wheels). It just means the motor needs to be sized for the job, and have adequate cooling. Internal fans are not sufficient for this, since they aren't moving at low speeds when you need cooling the most. We are therefore using an external blower for cooling. I love the Sunrise backbone frame design. Much like what Colin Chapman used in the Elan and Esprit, among other models. Yes; many successful EVs have used the backbone frame design to get an exceptionally light and strong chassis. This is the key to getting good range and performance with an affordable electric car. Instead of depending on very expensive unproven "superbatteries", lighten the car so standard affordable ones can do the job. Besides the Sunrise, the McKee Sundancer and GM's EV1 have taken this approach. As for the batteries, what nominal capacity are they? The prototype has 22 6v golf cart batteries, rated at 75 amps for 145 minutes. That's (22x6v) x 75a x 145/60h) = 24 KWH at the 75 amp rate. Since the Sunrise uses about 100 amps at 60 mph, that corresponds to a range of 110 miles at a continuous 60 mph. This pack weighs around 1600 lbs. I'm drooling over the Sunrise EV2's battery box. 53 TS-LFP260s or maybe 53 TS-LFP300s. Lee is allowing for up to 1600 lb of lead; 53 LFP300s are only 1100 lb. Looks like 150-200 mile range to me! Yes; it's a *big* box! And we have the load-carrying capacity as well; it can easily carry a battery pack that's heavier than the entire car, and still be under the GVWR of the suspension. Why not lithium? You end up with a vehicle weighing almost half! That can mean something like 80% longer range, right? Lithiums are good; but not that good. :-) Let's run some numbers and see. The EV2 will weigh about 1800 lbs without batteries, or 3400 lbs with a "full load" of lead. The lead-acid pack we bought cost $3000. Suppose we replaced the lead-acid batteries with a smaller lighter lithium pack with the same KWH capacity. They would have to be special low-resistance high-current types, or we wouldn't be able to draw enough current for the same performance. For example, A123 cells (as found in Bill Dube's "Killacycle" racing motorcycle). Each cell is 3.3v x 2.3ah = 7.6wh; so 24 KWH requires 3160 cells. It would be light (about 500 lbs), but cost about $16,000 (at $5 per cell). This reduces the EV2's pack weight by 1100 lbs! But it only reduces the total vehicle weigh by 30%. This in turn reduces the energy per mile by about 15% (since half the losses are from friction and wind resistance, which aren't proportional to weight). Since we have the same amount of "fuel" (24 KWH), we only have 15% more range. Acceleration, which is proportional to weight, would be 30% better. Or, we could keep the pack weight the same and increase the range. Tesla took this route. Their pack delivers 56 KWH, weighs 990 pounds, and uses 6831 18650 laptop cells. This pack has 2.3 times the capacity, and since it is also 600 lbs lighter, it has perhaps 2.5 times the range. Lead-acid's 110 mile range becomes 275 miles! But, it costs $36,000 versus $3,000. At the present time, lithiums are out of our price range. We'll have to get by with "only" 110 miles range. Lithiums would be great for "showing off" and setting records! But everything hinges on what you want. The car is built so you aren't locked in to one battery or another. The battery box is removable, and big enough to put in just about anything. Each person has his own budget and goals. You can use cheap lead, or expensive lithium, or hard-to-get nimh, or whatever else you want. What about the body? Are you just using the finished part you bought or have you developed molds so you can make more? The original Sunrise molds are available to us, but useless. They were designed for mass production, and the setup charges are in excess of $100,000. Plus, we've changed the design enough so the old molds would require too many changes to be practical. Are you using carbon fiber for the body? That should greatly reduce the weight. It doesn't "greatly" reduce the weight, but it does save some. Due to cost and being harder to work with, it is used sparingly. Even the original Sunrise only used it in critical high-strength areas. At present, we're using glass cloth and West System epoxy resin for the composites. But the molds can be used for whatever the builder wants; from cheap chopper gun glass fiber and polyester to hand-laid carbon/kevlar/glass cloth and epoxy. How do you provide vacuum for the power brakes? The donor cars have power brakes, of course. If you use their master cylinder, you'll need an electrically driven vacuum pump for the brakes. In the prototype, we made the metal plate that mounts the upper A arm a little too big, and it got in the way of the T'Bird's master cylinder. So we installed a Wilwood Engineering master cylinder. A lot can be done by selecting the master cylinder piston diameters to make power brakes unnecessary. If the pedal force is too high, we'll go back and address this later. Or, you can use the stock T'Bird master cylinder, with an electric vacuum pump. This would be the best option if you want to keep the ABS braking system. Why the change to air bag suspension? The Sunrise EV2 is considerably lighter than the donor cars. Their stock coil springs would produce a harsh ride and too high a ride height. Air bags allow easy suspension adjustments to suit the new weight. They also allow for different battery pack weights. The donor cars have power steering. How are you doing it in the Sunrise EV2? We installed the T'Bird's power steering rack and pinion unit, but haven't plumbed it into the hydraulic pump yet. That's because we converted the differential to dry sump lubrication, and have the hydraulic pump in the rear as an oil pump for the differential. It's being driven by an electric motor. The Cafe Electric Zilla motor controller is liquid cooled, using the same pump and lubricant as the differential. In effect, the differential acts as the "radiator" to cool the controller. The oil is RedLine Superlight Shockproof synthetic gear oil, which has the low viscosity of ATF but the high film strength of 75W90 gear lube. We also plan to try using the same pump and oil for the differential, power steering, and controller cooling loops. We're consulting with hydraulic experts on the right choices to make this work. I see you're using direct drive in the Sunrise. I hope to use direct drive in my EV. How does two 9" ADC motors each with their own 1200A Raptor in a 3000# vehicle sound? How do I figure the gear ratio? It sounds fast! Are you trying to make a race car, or a daily driver? Or both! :-) We're aiming for a daily driver, but also want it to be fairly peppy. Let's try an example: Your 2000 Chevy S10 pickup. Enough torque to match the ICE with transmission in 2nd gear (to climb hills). Enough RPM to match the ICE with transmission in 4th gear (for top speed). Torque: In 2nd gear, the transmission multiplies motor torque by 2. So the ICE torque on the drive shaft is 140 x 2 = 280 ft.lbs. The ADC 9" motor needs 1100 amps to produce 280 ft.lbs of torque without a transmission. 1100a with a 144v pack is around 122 HP. Speed: Stock tires are 26" dia. = 776 RPM at 60 mph. 776 RPM x 3.73 is 2900 RPM at the drive shaft (and motor for direct drive). The ADC 9" hits 2900 RPM with a 144v pack at a load of 155 ft.lbs at 640a. 2900RPM at 155 ft.lbs is 85 HP. So, we can match the ICE's peak torque and almost match its peak horsepower with a single 9" ADC motor and 1200A Raptor controller. But, the current is high! You can do it for perhaps 1 minute, but the motor and controller don't have enough cooling for sustained operation at this level. This is why most direct drive setups use a higher numerical gear ratio. It raises motor RPM, which lowers motor current, so you can operate longer without overheating problems. The ADC 9" is good for 4000 RPM, so you could change the differential to 4000/2900 x 3.73 = 5.14:1. Now the motor only needs to produce 203 ft.lbs, which takes 800a. Now it will be at 4000 RPM at 60 mph. With the same 144v pack, it will produce 70 ft.lbs of torque and draw 400 amps at full throttle. That's 53 HP, which is enough to maintain 60 mph even on a slight incline. The HP is limited by the higher motor RPM and pack voltage; to raise the HP back up for faster acceleration or hill climbing, you'd either raise the pack voltage, or use field weakening. Field weakening? How does that work? Field weakening switches a resistor in parallel with the field, so that part of the current goes through the field, and the rest goes through the resistor. It is only enabled at full speed, when the controller is already "full on" so you can't get any more speed from it. To go from 53 HP to the same 93 HP as the ICE, you need to raise the motor current from 400 to 700 amps. This is roughly a 2:1 increase, so you'd connect a resistor roughly equal to the field's DC resistance in parallel. This is basically what we're doing in the Sunrise EV2. We have a single Netgain WarP 9" motor, 5.14:1 differential, and a Zilla Z2k 2000a controller. The low differential ratio provides the torque at low speeds. But we also added 2:1 field weakening, to allow us to get full power at high speeds. Some TBird/Cougars have big rear ends and some have cast aluminum suspension parts. WHICH models have the more desirable parts? I'm eager to start stockpiling T'Birds/Cougars. The turbocharged V6 and V8 T'birds and Cougars ("Super Coupes") have the larger differential. The early years (maybe just 1989?) had stamped steel rear A-arms; they later switched to cast iron rear A-arms. But the Lincoln Mark 8 is the same car, and they had cast aluminum rear A-arms and differentials. I just don't know what years or trim options they were in. The Lincolns also had air bag suspension, which we use on the Sunrise EV2. I enjoy following your knowledgeable postings on the evtech forums. They led me to your Sunrise EV2 project. I'm curious about your setup using the inverted differential, and wonder if you’ve posted any details about your dry-sump lubrication? We begin by cutting a 5" section out of the front center of the subframe. It was flipped upside down, and welded back in. This made room for the differential to be rotated 170° so the pinion now points backward instead of forward, and is now above rather than below the axle line. It's 170° rather than 180° to provide a 10° departure angle (so the rear of the motor is higher off the road). The donor cars mounted the differential to the subframe with rubber mounts. We hard mounted the differential and motor to the subframe for better alignment accuracy. The donor cars also had rubber mounts between the subframe and body. We will retain these, but left them out of the steel prototype chassis for now. A standard spider motor coupler connects the pinion to the motor. Only a tiny bit of machining was needed to mate it to the Ford pinion. We changed the differential to 5.14:1 gears. Two new holes were added for pressure lines for lubrication; one between the two pinion bearings, and one with a nozzle to spray oil on the ring/pinion meshing points. The axle bearings are lubricated as usual, by flung oil running down the sides. A new drain line was added at the bottom (since the stock drain plug is now at the top). We lubricate it with Red Line ATF with an EP additive. An external oil pump provides about 1 gal/min. It also circulates the oil through the Zilla controller for cooling it. In effect, the large mass and surface area of the differential serves as the "radiator". Longer term, we want to try using this same pump/oil for the power steering, but don't know yet if that will work out. The EV2 sounds great! How do I start? We have about a dozen people working on the Sunrise EV2 project, and three cars under construction. Unfortunately, the plans aren't for sale yet. Our prototype isn't finished, so we aren't at a point where we feel comfortable about providing them. I'm sure there will be changes; and engineers hate to let go of anything that isn't "finished"! Buy a 1989-1997 Ford Thunderbird, Mercury Cougar, or Lincoln Mark VIII. A V8 or turbocharged V6 version is preferred, as they have the better 8.8" differential. Strip it for parts. You need the front and rear subframes, and the entire steering and braking systems. You also need the doors with the hinges, latches, weatherstripping, and everything that goes with them. Modify it for dry sump lubrication (add 2 oil lines). Replace the ring and pinion with 5.14:1 gears for a Netgain WarP 9" motor (or whatever is suitable for your choice of motor). Remount the differential upside down, so the pinion now points rearward. Make a 1/4" steel motor mounting plate, with center hole for the shaft and bolt holes for your motor's end bell. Buy a spider coupler from Grainger (we've got the part#s). Half mounts to the pinion, the other half to your motor shaft. With more flat 1/4" plate, weld the mounting plate to the subframe. Add new steel brackets to rigidly mount the differential to the subframe (in place of the rubber mounts). Mount the motor to the mounting plate, with the coupler. Cut off a few small brackets that aren't needed and get in the way. Replace the front struts with air struts, so they're adjustable to deal with the weight reduction. (Note: Lincolns come with air struts). We plan to include an onboard compressor for the air bags or for tire inflation. Our goal is to pick one that can also be used as a vacuum pump for the power brakes. Make a 16 gauge sheet steel battery tunnel, 15"w x 12"h x 10' long. We made ours as two U-shaped pieces, welded together, but it could also be flat plate, welded at the corners, etc. This is the backbone frame of the car. Carefully position your front and rear subframes so they are square and have the right wheelbase etc. The tunnel sits on top of the front subframe, and ends at the rear subframe. Trim, gusset, and weld or bolt the tunnel to the subframes. From here, we made our floor and the rest of the prototype chassis out of sheet steel, as we're still playing with the design and steel is easier to change. At present, we're making the molds for the production composite chassis. Check with us; if it is ready, you can buy it from us. Or, build your own the way we did it. Use the steel body of your donor car as a mold for the critical subframe mounting points. Make the rest of the chassis by Burt Rutan's "moldless composite" construction techniques (he sells books on it). Basically, you use polystyrene, polyurethane, balsawood, and plywood as a lightweight core to rough out the basic shape of the floor pan and wheel wells. The material chosen depends on the strength needed, and what you can afford. Fiberglass the core chassis top and bottom. It is mostly fiberglass, with carbon fiber in higher strength areas. We use West System epoxy; polyester is cheaper but a lot worse to work with. Make a battery tray out of fiberglass the same way. Basically, it's a 5-sided box with a center web, and a lid. It slides into the tunnel from the front. Install the steering and braking systems from your donor car. Bolt on seats and you have a drivable chassis! Going forward from here, you'll need a body. We originally thought we'd use the Sunrise body we got from Solectria as-is, but it had problems and is being modified. When we're happy, will use it as a mold to make our own bodies. You'll be able to buy one from us, or we can provide templates so you can "roll your own". We're working ahead of you, and should have bodies and other parts ready before you get this far. We've been making new molds from our Sunrise body, and for the new parts of the body that we changed. The test mule is using the existing Solectria body, mainly for expediency. The Sunrise EV2 Project, © 2007-2013 by Lee A. Hart. Created 3/22/2012. Last updated 10/15/2013.